Calva Louise's Rhinoceros is an album filled to the brim with barely contained, charging pop-punk songs replete with fizzing melodies that snake their way under your skin. It's often easier to fit in than rebel. Rebelling takes spirit. Rebelling causes conflict. Rebelling frightens people. It's much easier to toe the line, obey the rules, and keep off the grass. However, when we all conform to the same narrow idea, it can lead to much much worse, namely inflexibility, intolerance and, more seriously, autocracy. That is the central message behind Eugene Ionesco's 1959 play, Rhinoceros. A seminal piece of work that urged active resistance against the threat of social conformity. 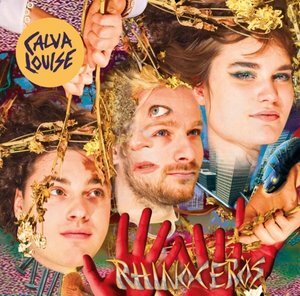 Taking Ionesco's theme as the inspiration for their debut album, aptly also entitled Rhinoceros, multi-national, London based pop-punk band Calva Louise reject the idea of conformity. The band see music as a way to lock into a society that expects direction but also affords the freedom of individualism and self-expression. This is more than evident on these ten spikey, pop-punk tunes filled with colourful detours and bold experiments. Bounding out of the blocks, "I Heard a Cry" is a quick hustle of a song with the band showing off their playful, poppy side. Riding a springy bassline and a kinetic bubblegum-punk riff, the song pings around with all the boundless enthusiasm of an overstimulated toddler. Jess Allanic's tightly wound, infectious vocals leap around the mix as an onrushing flock of hooks jam up the speakers. The taut and catchy blitz of "I'm Gonna Do Well" opens with a clean, echoing guitar riff, quickly joined by thick, riotous walls of distorted power chords. With inventive guitar lines backing up together seemingly in a rush to nudge the last out of the way, the song hurries its way to a joyously perky Buzzcock's indebted chorus. "Tug of War" is full of twitchy, kinetic energy with riffs and hooks lifting off and bursting like fireworks. Musically, it shares the messy energy and snappy pop-punk of early solo Graham Coxon with a chorus that quickly hits the blood supply and widens the pupils. The band's debut single "Outrageous" is a snarling, punk gem that fizzles with electricity. Take the catchy indie rock of the Joy Formidable, the more primal scuzzier parts of Blood Red Shoes, slam them together and charge them with youthful energy and you're halfway there. With its circling chord figure and whistled hook, "No Hay" finds Allanic singing completely in Spanish. It's a prime example of the band broadening their palette by following an unexpected and original path and ending up somewhere much more compelling. The explosive blast of "Getting Closer" sparks with the fire of creativity burning so brightly you can almost feel it crackling through the speakers. With a popping bassline, backed by fairground wurlitzer and echoing guitars the song quickly lurches from second to fifth gear as Allanic launches into a full bloodied, tonsil shredding scream. It becomes quickly apparent that Calva Louise are not the kind of band to stick to a single formula. Whilst they are working from a clear, definite blueprint, they allow plenty of room for experimentation. "Wondertake" slows the pace down to a mid-tempo waltz while "Cruel Girl" adds a sprinkling of classic two tone as the ska keys and bouncing bassline fuse together with the punkier guitar. "Down the Stream" takes in elements of sunny, surf rock on a bright and breezy number that shows off a band working to distance themself from the norm. Closer "Out of Use" quickly shakes itself loose with a swaggering riff and a cavalcade of pounding drums. Like the quickening intake of breath, the band slowly build muted power chords that get louder and louder until the song erupts in a cacophonous roar, finally crumpling in on itself, having spent every ounce of energy. On Rhinoceros, Calva Louise have followed their instinct and toyed with conventions, finding a sound that is honest and authentically them. The result is an album filled to the brim with barely contained, charging pop-punk songs replete with fizzing melodies that snake their way under your skin.